Please join us on Thursday, October 27th for the FREE annual DMC Conference. The conference will be held at the Orthopedic Institute from 7:30am-12:30pm. The one-day DMC Conference will draw together parents, students, counselors, law enforcement, school staff, juvenile justice professionals, judges, State’s Attorney staff, and human services professionals to learn from national and local speakers. The conference goals are to increase awareness of racial disparities in the juvenile justice system, explore existing and dreamed-of resources for youth and families of color and those who work with them, and improve how families and the community can work together to reduce the number of minority youth in the juvenile justice system. If you are a black, Hispanic, Asian, or Native American youth in Sioux Falls, you are more likely to be arrested than your white classmates are. If you are black, you are five times more likely to be arrested. If you are Native American, you are ten times more likely to be arrested. Even with the array of post-arrest diversion programs now available in Sioux Falls, a disproportionate number of minority youth still end up in juvenile detention, where they are separated from their school, family, and the workforce. The Disproportionate Minority Contact Work Group focuses on helping our community and families work together to help minority youth avoid juvenile offenses and involvement with the juvenile justice system. An abundance of national research shows that punishment and incarceration, rather than restorative justice and rehabilitation, is harmful to youth and is associated with increased rates of re-offending, lower educational and vocational success, and incarceration later in life. The national Youth Justice Work Group recommends 10 points for youth justice reform. Our conference will address several of these points, including eliminating racial and ethnic disparities; engaging youth, families and community; improving cross-system collaboration; and creating a range of effective community-based supports. When we can all work together effectively, the long-term benefits to Sioux Falls will be significant. A 2009 Vanderbilt University study found that diverting just one youth from a life of crime, incarceration and unemployment would save society from $2 to $5 million over that youth’s lifetime. Please come join us for an opportunity to learn more about DMC work and how you can best work with youth in our community to help them achieve success. *To register for the conference, please email Annie.Brokenleg@LssSD.org with you name and contact info. 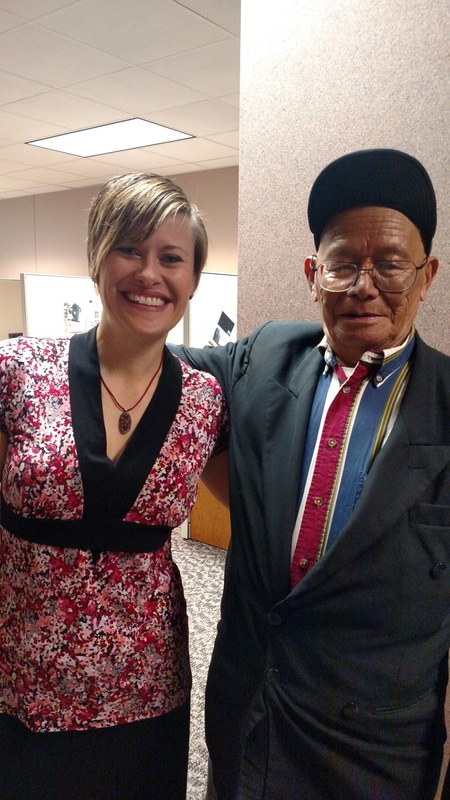 Last week we introduced you to one of the amazing students we have here at the LSS Center for New Americans, Karna Mongar. Karna, originally from Bhutan, came to America from Nepal in August, 2012. Karna, our oldest student, is always outgoing and positive. He ritually presents his teachers with a handful of Halls cough drops after daily classes. Karna talks with everyone he meets in as much English as he can muster and then resorts to Nepali, his native language, when he runs out of words in English. Because of his always fascinating and humorous English/Nepali anecdotes, I wanted to learn a little more about Karna. So I asked my co-worker, Deo Rai, to be our translator for a brief interview. Here is what we learned! Karna: I will be 92 in October. Laura: What languages do you speak? Karna: Bengali, Hindi, Dzongkha, Nepali and Chinese (but I have forgotten the Chinese). Laura: How did you learn these languages? Karna: In my job. I was a police man in my village in Bhutan. Because I was very active, I was asked to become the bodyguard of a Bhutanese official, the Kumar of the Kalimpong region. I became the village head; I mediated conflicts and had governmental duties like making sure roads were maintained. I had that role for eleven years. Laura: At the age of 91, you are very intelligent, cheerful and healthy. What advice do you have for people who are younger than you? Karna: Nothing. I have tried to give advice in the past and no one takes it, so I have no advice to give. Laura: But I am asking you, so maybe I will listen to your advice! Can you please tell me? Karna: Work hard. Don’t leave a job incomplete. Do some exercises. If you do a good job, your country will appreciate you. Laura: Karna, you are very healthy and strong for your age. How do you stay this way? Karna: I seem younger than 91 because of my job in Bhutan. I wasn’t farming and building roads like other people. I was a police officer and a body guard. It wasn’t physically hard work. Also, I walk two times each day. If someone else walking on the sidewalk tries to compete with me, they can’t win! LSS would like to thank the Thrivent Chapters in South Dakota for all their support through the years. As Thrivent closes all of its remaining Chapters nationwide on September 30, it’s time to look back and appreciate all the work that has been done to support so many causes. I started at LSS more than 18 years ago, and that’s when I first heard about Aid Association of Lutherans and Lutheran Brotherhood. Both began in the early 20th century, offering Lutheran families the security of insurance contracts. Both non-profit fraternal organizations were dedicated to making their communities better by giving funds to charities. In 2001, the two organizations merged to become Thrivent Financial for Lutherans, a name that has since been shortened to Thrivent Financial. Part of their mission was giving funding to events and projects, which was done primarily through the Chapters. I’ve been honored to work with many Chapters throughout the state–from Lawrence County to Roberts County to my own Chapter—West Minnehaha County. Our area dinner benefits, Watertown Golf Tournament, and Taste of Cultures events have all benefitted from Thrivent Chapter sponsorship. Funds for projects have enabled us to provide more for those we serve; the most recent being funds to purchase small incentive gift cards for youth referred to the new LSS Evening Report Center. The ERC is an alternative to detention that allows youth to remain in the community while receiving additional services. LSS staff disperses a gift card when a youth does a good job at improving a school grade on their report card or getting a job interview or a job, etc. This is an encouragement for them that would not have been possible without the funding from a Thrivent Chapter. I’ve been privileged to serve on the West Minnehaha County Thrivent Board for a number of years, and our last Chapter meeting was last week. I’ll miss the gratifying work and the fellowship with fellow board members, but I’m excited for the changes coming to Thrivent in South Dakota. If you have a chance, give a Thrivent Chapter Board volunteer your thanks for all the support they’ve given to LSS of South Dakota. Every once in awhile, we have a special phone call of someone saying, “we want to do this with you.” Last spring was one of those times. The national nonprofit K.I.D.S/Fashion Delivers contacted LSS to see if we could partner to do a shoe distribution event. They had never done an event in South Dakota and wanted to give back to kids in our area. Their model for coordinating a giveaway is to partner with a local nonprofit to identify the location and get the event set up. SKECHERS and the local Shoe Carnival worked with LSS to plan and carry out the event. 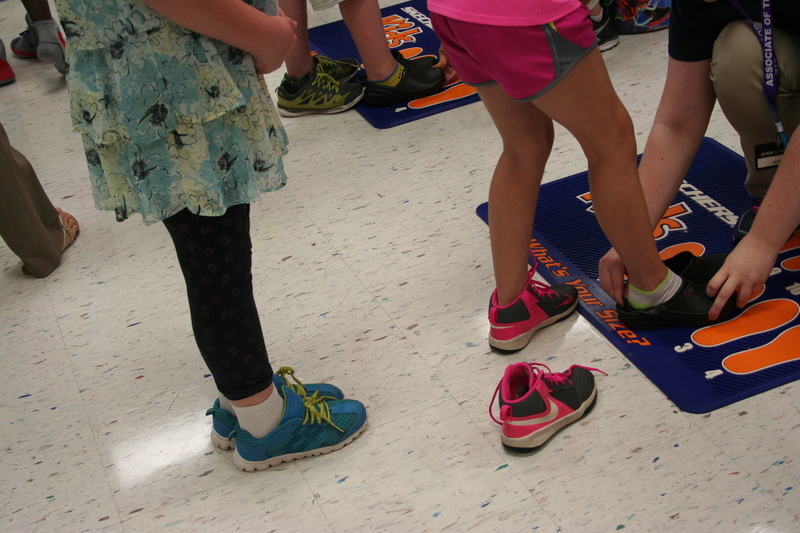 In the course of the day, over 700 pairs of BOBS from SKECHERS were donated to Garfield Elementary students. They also left a number of shoes there and will send an additional 150 pairs to use as new students transfer in and as other needs arise throughout the year. 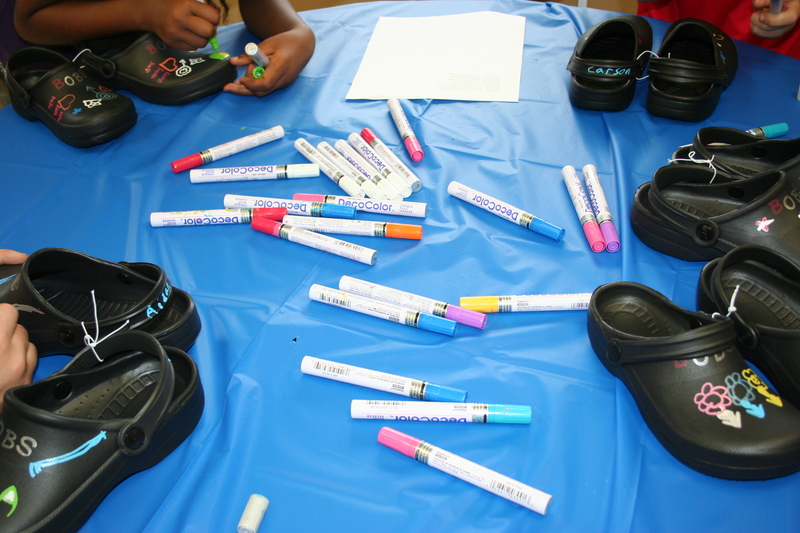 After receiving a new pair of shoes, children had an opportunity to customize them at hosted decorating stations. 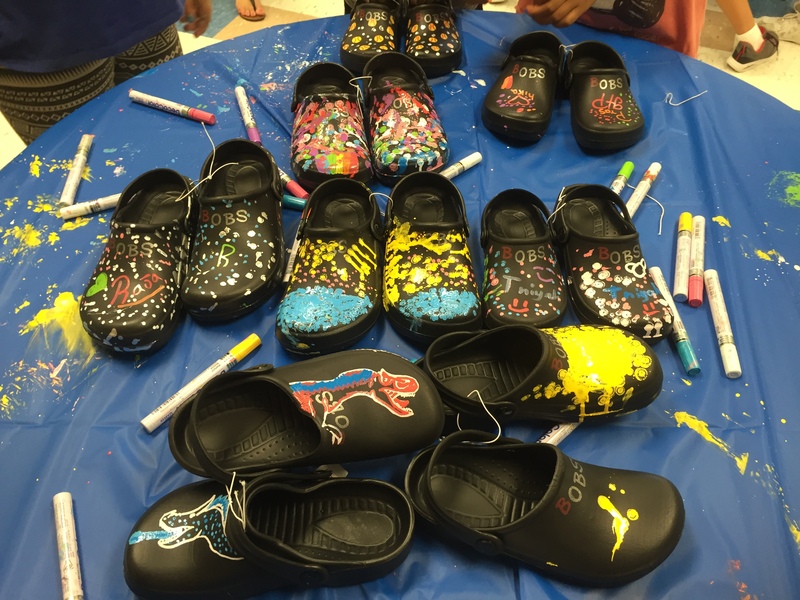 Students creativity blossomed and they came up with amazing and fun designs on their shoes! To date, Skechers and Shoe Carnival have partnered to donate over 48,500 pairs of shoes to children in need nationwide. Since the BOBS from SKECHERS program launched in 2011, SKECHERS has donated more than 14 million pairs of new shoes. THANK YOU so much to Shoe Carnival, SKECHERS and K.I.D.S/Fashion Direct for a great day! We also owe a big thanks to the staff at Garfield, especially the Counselor/Success Coordinator and Principal. It is evident that they care so much for their students. The students were all so appreciative and had a great time thanks to the efforts of everyone. 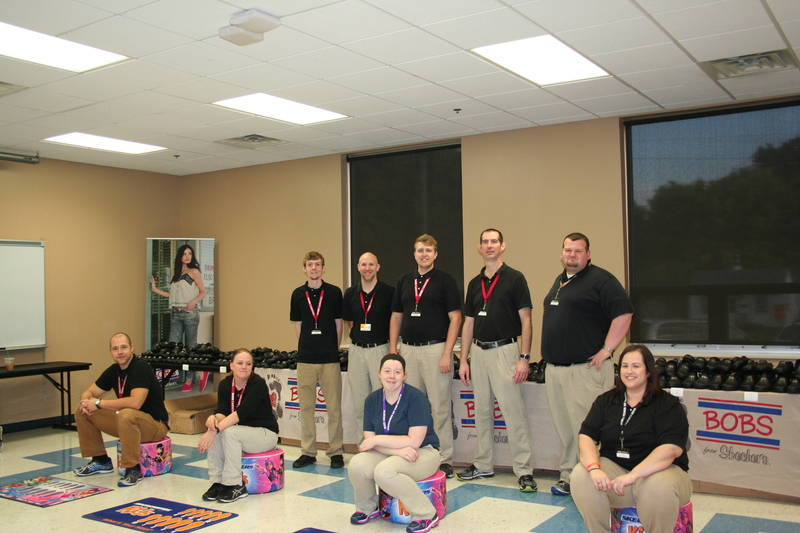 The team from Shoe Carnival ready to fit hundreds of students for shoes! Making the shoes their own. The fun and colorful finished products. 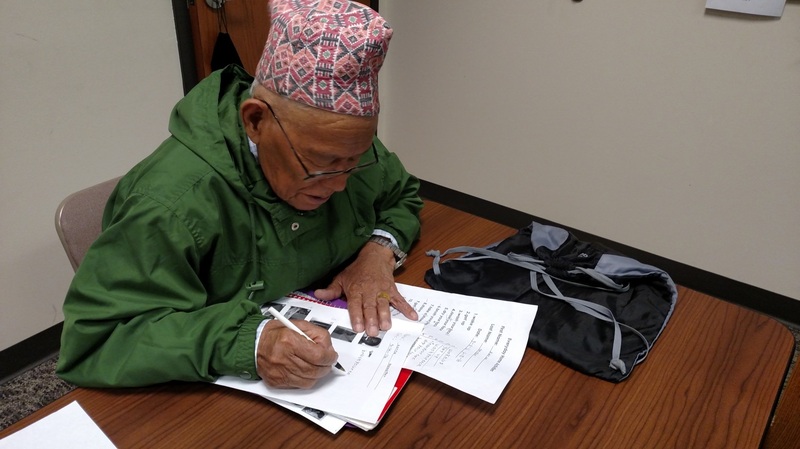 We would like to introduce you to one of our students here at the LSS Center for New Americans- Karna Mongar, also known as “Grandfather Karna.” Karna makes an impression on everyone who has the opportunity to meet him. Karna came to America from Nepal in August of 2012 . He is originally from Bhutan. Now, he takes the bus to our center for English Classes daily, Monday through Thursday from 10 to noon. Karna, the most senior student in class, is always able to quickly complete the task at hand whether it is speaking, reading or writing in English. Sometimes, when he’s in an especially chipper mood he will quietly sing a traditional song in his native tongue – Nepali. Everyday after class, he chats with his teachers, says “Boli aunsu” (“I will come tomorrow,” in Nepali) and gives them a heaping handful of Halls cough drops. Now I have two bags and a bowl overflowing with cough drops in my office, but Karna won’t take “no” for an answer. He maintains this daily ritual as faithfully as he comes to class. Karna is relentless in his desire to communicate with everyone he sees. He will use all the English he knows and when he runs out of English vocabulary he will continue in Nepali, whether the listener can understand him or not. When we don’t understand him, his smile, teasing expression and the laughter from his classmates bear evidence that Karna has a great sense of humor. I didn’t need to know Nepali to understand he was showing off the list of languages he can speak. Of course, I smiled – “OK. No problem. Today, Teacher Karna. No Teacher Laura. Teacher Laura is a student today!” As I moved to sit in his regular seat at the table, Karna turned the classroom back over to me. Karna has piqued my curiosity with his brief English-Nepali stories. It is surprising how much you can understand from someone using 50% English and 50% of their native language supplemented with gestures and facial expressions. After class, Karna shared a little anecdote with me. He repeated his list of languages, marched like a soldier and mimed a rifle in his arms while speaking Nepali. So I understood that in addition to some English, Karna speaks five other languages and this has something to do with him being a soldier of some kind back in Bhutan. Lori Blom, a volunteer in the LSS Better Together Program sent us a great piece on perspective. We knew we needed to share it with everyone. As we were working with the Sioux Empire United Way to develop the program, stories like this are what we envisioned. We hope you enjoy reading it, and if you want something like this for your family and kids, apply today! There are seniors waiting for someone to share their time and life with. Yesterday, I learned a valuable lesson from our friend M, who is 100 years young. When the kids and I come to visit her, we often stay in her apartment playing cards and chatting. But on this occasion, we also went to the corner cafe in her building where I bought a couple of treats. M learned of our upcoming road trip and told me to keep the containers and fill them with snacks to bring for the kids. I probably would have just thrown away those containers if not for her comments. See, M was born in 1916. She grew up using everything….and then reusing it. We tend to think of our culture as green and recycling, but we have nothing on those previous generations. To honor her, I took those containers and brought them home. Washed them out and filled them with fresh fruit and veggies that our kids did eat during the first leg of our journey. Recently, Pastor Clyde Teel (Community Reformed Church) shared that we aren’t on this earth just for ourselves. If we are still here, we are here for somebody else. I know M wonders why she is still here at 100 years when she is ready to see Jesus. I have to think that it is partly for our family. It’s appropriate that the name of the program that matched us together is called “Better Together”. I am a better person because of her and the time we spend together…and hopefully it is making an impact on our kids too. Thanks, Lori for sharing this insight with us and thank you for sharing your family with M. We know she enjoys the time too. You are currently browsing the LSS Touching Lives Blog blog archives for September, 2016.